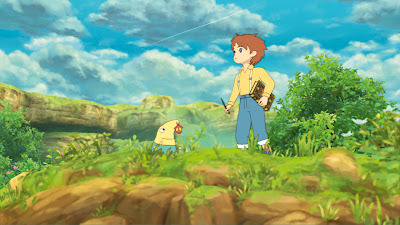 I played Ni No Kuni for the first time at SDCC and it was love at first sight. Though I had already preordered the game and was thoroughly excited, seeing the graphics, experiencing the gameplay, and becoming immersed in the world solidified it all. After my twenty minute affair with the game, I was ready to throw down as much money as possible to get it -- and pay I did. Even though I had already preordered it, I decided to do it again for the exclusive Wizard’s Edition. This edition came with killer preorder bonuses, including a real book explaining the lore from the world with monsters’ stats, spells, and history. I had to have it. I cancelled my previous preorder and waited anxiously for the six months it would take for release. First, I got an email in August saying the game would be released September 4th. After happily scrambling to confirm this news and being in a general daze about potentially getting to play the game four months early, it was confirmed to be an update bug in the system. Kind of cruel, but I understand. These things happen. What shouldn’t happen is what happened on release day. I was told by the rep I preordered from that I would receive my copy the day it came out. Sure enough, the day came and went with nary a package. Perhaps he was mistaken, I thought, surely it shipped today and will be overnighted. I decided to do my research and sure enough, I wasn’t the only person having problems. All across the internet, people were confused about what was happening to their orders. The official order page had changed the title to append “SOLD OUT!” to the front, an omen of bad things to come. Talks of cancelled orders were going around with evidence of credit cards not being charged. I checked my statement and sure enough, nothing from NamcoBandai. A day later, the problem was so bad, there was a dedicated thread to answering questions about the incident created by not an employee, but a customer. 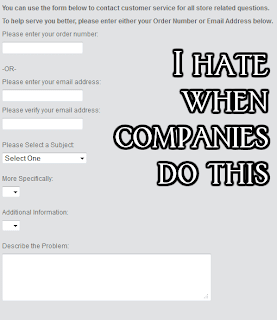 Yes, this problem warranted an FAQ. Not one created by NamcoBandai, mind you, but rather by one person just wanting to play the game he tried to pay for. So had they let us down? Was NamcoBandai, the company responsible for so many classic and iconic titles in gaming culture, responsible for disappointing and nigh-betraying their customers? The answer is complicated. Though the storefront is for NamcoBandai, the company actually keeping track of orders and shipping them out is Digital River, an ecommerce site responsible for the online stores of Microsoft, EA Games, and Capcom. Upon further investigation, Digital River is a company that’s riddled with problems. From leaking the personal data of 200,000 users in 2010 to botching orders for Mattel collectors, it seems Digital River is rife with problems, having online, verbose complaints since at least 2001. So what happened this time? It seems they oversold their inventory, which is an unfortunate thing that happens sometimes, and would be almost understandable under the proper circumstances. Unfortunately for Digital River, it was their oversight that caused the error. 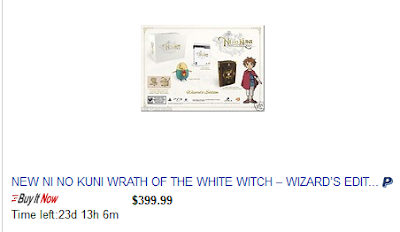 See, around the same time as the update glitch that showed the release date being radically pushed forward, there was an open preorder period for the wizard's edition called the NinoStarter in which anyone could order as many copies of the Wizard’s Edition as their heart desired. Seeing this, Play-Canada, an eBay upsale shop, preordered 200+ copies of the game. It was in this time that preorders for certain customers were cancelled unceremoniously and without notice, according to a Digital River representative. Play-Canada received their orders and claimed to have worked closely with Namco to have those orders filled. To make matters even worse, their price is exorbitantly marked up. Originally, their listing was for $199, but it increased to $249 toward the end of the year. If that wasn't bad enough, on the day Namco announced they could not fill all the orders, their prices skyrocketed to $399. Around this time, pitchforks started rising, BBB claims were being filed, and Digital River was scrambling to find a solution. All hell broke loose on the internet. Numbers for Digital River support were given to inquire about orders, workarounds for DR’s buggy shipping notification system were talked about, and at some point, and an ordering backdoor was found and quickly turned off. Oddly enough, those who used the backdoor got their orders whereas some people who preordered as early as July did not. About this time is when Namco finally broke their silence on the matter. Though they denied any involvement with Play-Canada and claimed the issue was a glitch in Digital River’s system, they could not help the customers whose orders were cancelled. The affected customers were to receive the game, a hard cover copy of the strategy guide, and a $20 credit to the Namco store. Presumably, the cost of pulling the materials together for more Wizard’s Editions was too great, leaving many gamers without something they preordered months in advance. After calling and emailing, my payment was finally processed and my Wizard’s Edition on the way. Once I received it, the book alone was more than worth the extra time and hassle. But that doesn’t make it better, it actually makes it worse. Now legitimate customers can’t get what they tried to pay for without going through over a 200% markup by an eBay scalper. Did Namco screw up? By trusting a company with such a bad track record, yes. Perhaps it’s unreasonable to ask for more Wizard’s Editions to be created, but what they offered in compensation pales in comparison to what the jilted gamers want. The strategy guide, though beautiful in its own right, simply doesn’t fill the shoes of the wizard’s book, and the $20 credit to a store still run by Digital River is no compensation for art, a soundtrack, collector’s coin, and a plush toy. I understand Namco is trying to placate gamers with free things, but at the very least make them equal in value to what gamers tried to pay for originally, if not get the Wizard’s Edition remade. 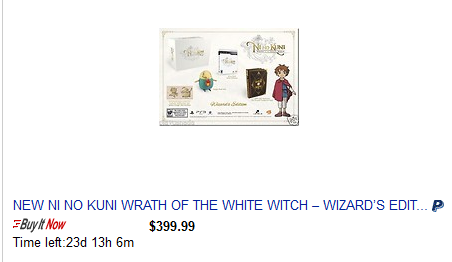 To make matters worse, Play-Canada still has their copies of the Wizard’s Edition up for sale for $399. Though, on the surface, it’s a rotten thing for them to keep their copies, it’s a business decision to keep the things they paid for. But at the very least, at the very least they should lower the price to something reasonable, instead of using gamers' plight to make a quick buck. Ultimately, the blame for the fiasco falls on either the lacking tech, or ignorance of Digital River. Their negligence caused the situation, their sluggish response worsened it, and their system provided next to no information for a consumer to use to check on their order. Customers had to do their own footwork to find answers, find numbers they shouldn’t know about, and not have an answer to their questions for days. This is not good business for anyone and in the end, paying customers were the only ones who were hurt. What can be done to try and remedy this situation, and prevent future debacles from happening?